Every new year undoubtedly comes with a new set of ‘new years resolutions’ or what I prefer to just call ‘plans for the year ahead’. I tend ponder on what these might be in between Christmas and New Years eve and then start writing my list of plans the first week of January. Gosh this makes me sound very professional at it… haha. Two days into 2019 I was beach-side with the family and cramming in as much of my new book, ‘Rise & Resist’ by Clare Press, as I could in between making sandcastles and putting more sunscreen on my boys. I hadn’t read too many books in the past year as a result of the time put into starting my own business, however this book I was determined to get through at speed. 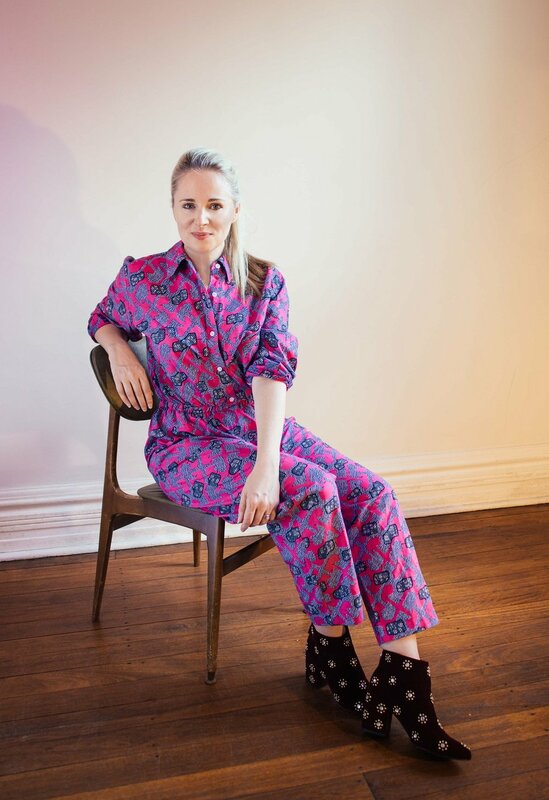 I came across Clare Press on social media in 2018 after learning Clare was the ‘Sustainability Editor at Large’ for Vogue Australia March issue with Emma Watson on the cover… an amazing sustainable style issue that I hope you didn’t miss. Clare quickly became my latest girl boss crush…. and when following her on Instagram it became clear that Clare was in fact a super woman for sustainable fashion also adding author, presenter, wardrobe crisis podcaster and global ambassador to her cv. I wanted to start this year off by telling you a bit about Clare’s book ‘Rise & Resist’ so that you too can awaken the active citizen inside you as it did for Livia Firth… and me! Covering topics of ‘The Pussyhat Project’, ‘On Craftivisim’, ‘Making the change you wish to see’, ‘Fashion revolution’, ‘Three ways to be an activist’, ‘We stand with you’, ‘Green Piece’, ‘The rise of the climate movement’, ‘Fight Club’, ‘Youthquake’, ‘SOS - Save Our Seas’, ‘The Anti-Plastics movement’, ‘Zero Waste’, ‘Let’s buy a tiny house’, ‘Rejecting money’, ‘Consumerism gone mad’, ‘Meet the minimalists’, ‘What’s the alternative’ and ‘On Mindfulness’… ‘Rise & Resist’ should be an essential read for everyone during 2019. The information and life stories researched by Clare have been written down in a way that brings you with her on her journey with pure ambitions to change the world. I must admit that during parts of reading this book I did think that perhaps this wasn’t my best choice for my summer beach vacation… perhaps I should have picked up the latest fiction romance by Sheila O'Flanagan or re-read one of my favourite Jacqueline Susann’s iconic vintage fiction gems. However, the more I read the more that I did feel that change was possible and I could be part of this. Clare’s research and views on the fashion industry only inspired me more to push forward and give everything I have to my business Outliv. Being a small business is not easy… but when you're doing something you are extremely passionate about it makes more sense than ever to do as much as you can to make it work. I am extremely thankful for how the last year has gone and the opportunities that Outliv has been given in its debut year of business and I will continue to push Outliv forward and to inspire change in the fashion industry by raising awareness to the importance of consumer choice. Closing in on the last few chapters of the book… the subjects and stories resonated with me and each chapter I read I found that I was more passionate about being part of positive change for the future of our planet. I’m already obsessed with recycling and loved reading about the concept of a Free Store and Grow Free tables and the ideal future of a circular economy. This book has left me inspired to make changes this year at a more local and community level as well as on a business level. Planting more vegetables and fruit trees, finding my closest Community Fridge and taking an active part in using it and encouraging others to do the same. Most of all… I am inspired by the evidence Clare gives that it only takes one individual to make change and that could be you or me. Clare has inspired thousands as a result of her sustainable point of views….!!! So lets all act now. I won’t say anymore. Rise & Resist by Clare Press. Available now!